Porto Platanias Village Resort” is located in the heart of the cosmopolitan village of Platanias. The newly renovated 4 stars hotel, is the ideal choice for relaxing holidays or vacations dedicated to discovering the treasures of West Crete. 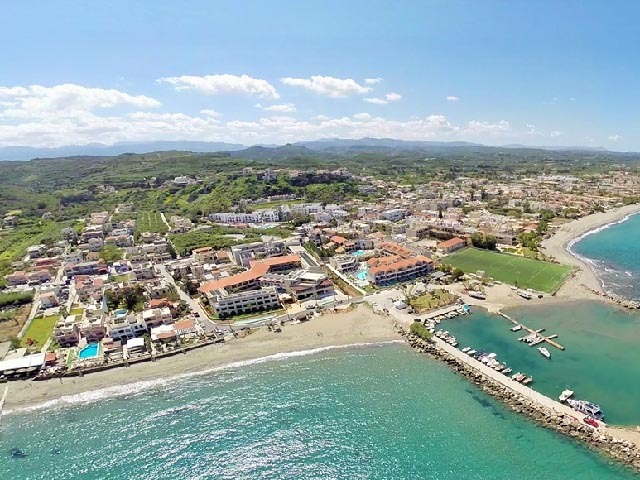 Porto Platanias Village, offers all comforts expected, a family environment, attention to detail, rooms decorated in an elegant style and peaceful external surroundings with small picturesque paths, squares and gardens full of flowers. The village of Platanias, attracts visitors from all over the world. It is a Mediterranean destination embraced by the sea and charming nature. 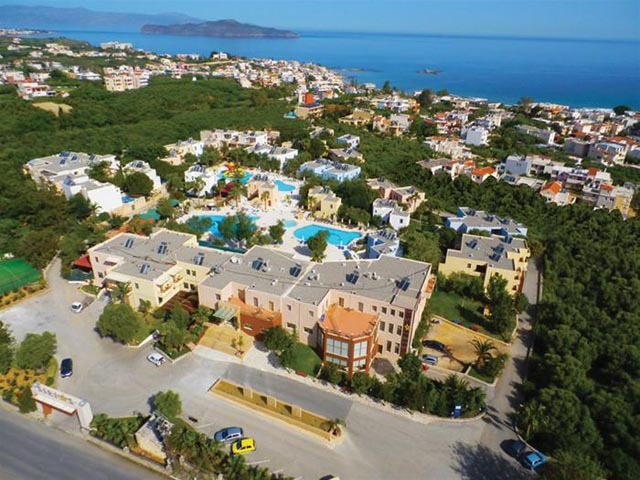 Porto Platanias Village is located within walking distance from the beach and the village of Platanias. Several shops, bars, restaurants and the vibrant feeling of the Cretan summer promise you will have great fun exploring the area. Platanias is the most suitable and convenient starting point of a lovely journey to flawless landscapes, white sandy beaches with an exotic look and feel, stunning nature in all its glory and the thrilling historical-archaeological sights of Crete. The picturesque Chania town is only 9 klm away. The magnificent light house and Venetian buildings are a must visit. Do not miss a the chance to enjoy a nice walk in the picturesque town of Chania. One-roomed apartments with a fully equipped multi-kitchenette and a fridge, a marble bathroom with shower and a hair dryer, individually controlled air conditioning, satellite colour TV, direct dial telephone, safe deposit box and balcony or veranda. Consisting of 1 main bedroom with 2 single beds and a separate sitting room with 2 sofa beds featuring a fully equipped multi-kitchenette and a fridge, bathroom with shower and a hair dryer, individually controlled air conditioning, satellite color TV, direct dial telephone, safe deposit box and balcony or veranda. 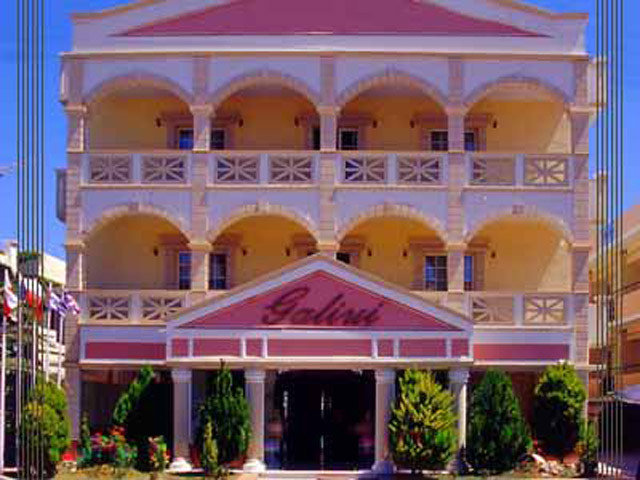 Consisting of 2 main bedrooms with 2 single beds and a separate sitting room with 2 sofa beds featuring a fully equipped multi-kitchenette and a fridge, bathroom with shower and a hair dryer, individually controlled air conditioning, satellite color TV, direct dial telephone, safe deposit box and balcony or veranda. Start your day having breakfast in our main restaurant and enjoy our rich buffet that offers a large variety of warm and cold dishes. Our chef promises to take you to a gustatory journey, full of local and international flavors in our Lunch and Dinner buffets. An atmospheric place, overlooking the outstanding gardens and the pool, serving dishes inspired by the Mediterranean cuisine. The service in Porto Platanias Village Resort is top-class, consistent with the very high quality of service in all the hotels of Porto Platanias travel group. Porto Platanias Village Resort has one of the biggest pools in its class – a huge 850 sq. m pool, with a 10 sq. m safe childrens pool in its side. Sun beds and parasols by the pool are free for all the hotel’s guests. There is a bar which serves the guests refreshing cocktails at late hours and for the younger guests a fully equipped playground with a creativity kiosk. You can enjoy an exotic cocktail or a refreshing drink while sunbathing by the pool.